A Year in the Life of Saint Lucia is a "366 day photo diary" - 2008 project of my beautiful island by Chester B. Williams for his daughter, Devyn. 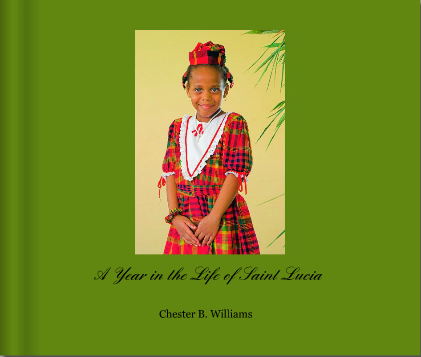 Chester B. Williams is St Lucia's premier Landscape and Fine Art photographer. A former Financial Analyst, who worked in Los Angeles, California, he returned home and embarked on a quest to photograph as many areas of the island as he could before over-development and mismanagement of the island's natural resources changed its landscape forever. "On January 1st, 2008, I began a quest to record life on the island of St Lucia for the entire year. As the island was due to celebrate its 30th Anniversary of Independence in 2009, I decided to paint an overall picture, with 366 photographic images, of what it is like to live on the island on the eve of that occasion. My formula was simple: leave my home at dawn and return at midday. Have a quick lunch and head out until sunset. Return home, have dinner and then edit my images. This was done everyday for the entire 366 days. ( 2008 was a leap year). Nothing was out of bounds and I deliberately sought to expose the viewer to areas of the island where the average person may not have had the opportunity to venture. What started out as a labor of love for me became an alarming and frightening reality as I bore witness to several instances of the mismanagement of the island's natural and cultural assets. Large tracts of land were cleared with no regard to the environment, beautiful old wooden homes were simply bulldozed and a large wetland area, where I photographed several species of birds, was simply drained to facilitate the building of a hotel, which to date has not even been started (see January 17th). In another equally heartbreaking case, several hundred acres of the last remaining habitat of the endemic White-breasted Thrasher, were cleared of vegetation in another hotel venture that failed. (see September 8th). In the space of only four years, the face of this island has changed forever. I hope the viewer of this book, especially the St Lucian viewer, will see and appreciate the beauty of the island and are inspired to do what they can to help preserve our heritage. This book of images portrays the island, frozen at a particular moment in its history. For this reason, I have chosen to record and share with the viewer the actual day and time that each photograph was taken. I have to say a special "thank you" to my wife Antonia, who was always there to encourage me during this unique and sometimes difficult undertaking. During the year, I suffered through a bought of dengue fever, several broken lenses, a broken camera and a car accident. I invite you to view, and hopefully enjoy, St Lucia through my eyes."